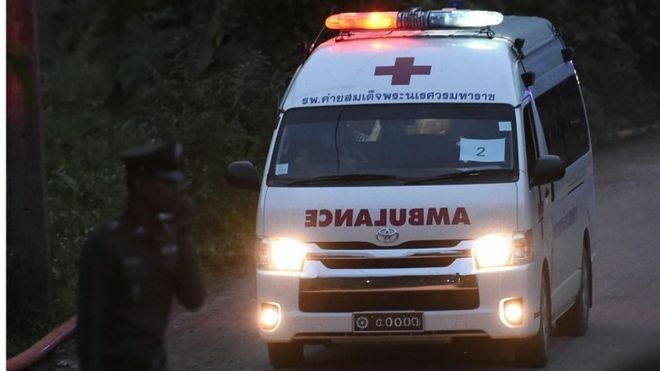 Divers have rescued four more boys from a vast cave system in northern Thailand on the second day of a complex operation. Four boys and their football coach remain inside the caves. Rescuers will try to free them on Tuesday. The group became trapped on 23 June after heavy rains caused flooding, and was found last week by divers. On Monday, air ambulances were seen departing from the area around the cave system and ambulances were seen arriving at the hospital in the nearby town of Chiang Rai. The boys have not been seen in public, but have been pronounced to be in reasonable health. Who are the Thai boys trapped in a cave? 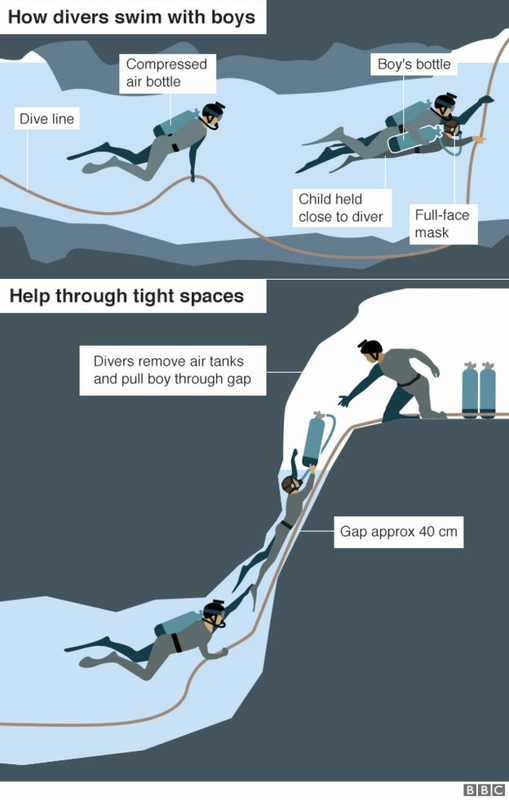 How risky is the Thai boys rescue? 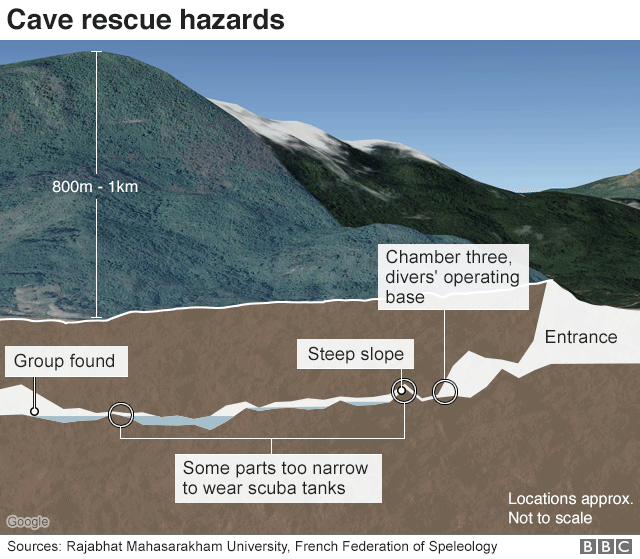 The rescue operation is complicated by sections in the cave involving diving – sometimes in very confined spaces – and climbing. The BBC’s Dan Johnson, at the scene, says it is a careful, delicate operation fraught with risk. But he adds that this daring, dangerous and complicated exercise is delivering success against difficult odds, and relief is starting to break the tension of the situation. He said the second day of the operation had gone more smoothly than the first, taking two hours less as the procedure became more refined. Tuesday morning will see the start of attempts to rescue the remaining four boys and the football coach. A massive pumping operation is said to have helped lower the water level inside the cave system, making the journey in and out easier than it was. The Thai authorities say the rescued boys are able to eat rice porridge, although their request for a favourite pork dish has been turned down until their digestive systems recover from 10 days without food. The government is strictly controlling information about the rescue. The names of the boys who got out have not been released, and even their parents have not been allowed to see them – for health reasons, say Thai officials. Outside the hospital where the boys were being received, there was a heavy police and media presence. Early in the afternoon, the sound of a helicopter thudded overhead. It was a sign that the rescue operation was going to plan. A few minutes later, a convoy with an ambulance swept through the streets and swung into the hospital entrance. It was carrying the first boy rescued on Monday. Then as dusk was falling, a small crowd of locals gathered outside the hospital. Word was filtering out that more boys had been rescued. People were straining to catch a glimpse of the unfolding drama. It came in the form of the flashing lights of three more ambulances – signifying the rescue of three more boys. The rescue operation will resume on Tuesday. It is not yet over and is still fraught with danger. But people here are daring to believe what seemed impossible a little over week ago – that all the boys and their coach will come out of the cave alive. How are the boys being moved? A team of 90 expert divers – 40 from Thailand and 50 from overseas – has been working in the cave system. They have been guiding the boys through darkness and submerged passageways towards the mouth of the Tham Luang cave system. Getting to and from where the boys are has been an exhausting round trip, even for the experienced divers. Wearing full-face masks, which are easier for novice divers than traditional respirators, each boy is being accompanied by two divers, who also carry his air supply. The toughest part is about halfway out at a section named “T-Junction”, which is so tight the divers have to take off their air tanks to get through. Beyond that a cavern – called Chamber 3 – has been turned into a forward base for the divers. There the boys can rest before making the last, easier walk out to the entrance. They are then taken to hospital in Chiang Rai. In an indication of how dangerous the journey can be, a former Thai navy diver died in the caves on Friday. Saman Gunan was returning from a mission to provide the group with air tanks when he ran out of oxygen. He lost consciousness and could not be revived. His colleagues said they would “not let the sacrifice of our friend go to waste”. Some details have emerged of members of the team and their coach. Assistant coach Ekapol Chantawong, 25, was said to be the weakest of the group when they were found, as he reportedly refused to eat any of the food and gave it instead to the boys. How did the group get there? The boys were found inside the cave by British rescue divers a week ago, about 4km (2.5 miles) from the cave mouth. Aged between 11 and 17, they belong to a football club called the Wild Boars, and became trapped during an excursion with their coach. It took nine days to find them in the underground network’s dark depths. The world football body Fifa has promised the boys seats at the World Cup final in Moscow a week on Sunday, but it remains to be seen if they will be well enough to take up the offer.